Until some years ago, asparagus was considered a delicacy (and was priced as such) because it was only available in the spring. And, although spring is the best season to find the freshest asparagus, this elegant-looking vegetable is now available year-round, mostly imported from Central and South America. Even though asparagus is a perennial and will, therefore, come back every year, harvesting asparagus is a laborious process. Once the plant is mature, it will sprout several spears every single day during harvest season, reaching their full height in 24 hours. If the asparagus spear isn't cut within that timeframe, it will grow into an inedible fern. So farmers have to not only harvest every day during the season, but they also have to cut each spear by hand. Now you can understand why asparagus is a more expensive vegetable at the market. The sugar in the asparagus plant quickly converts to starch after harvesting, causing a loss of flavor and a woody texture to develop. So there are certain things to consider when buying asparagus. Here are some tips to help you pick the freshest of the bunch. Fresh asparagus stalks are firm, straight and smooth. They should be a rich green color with a small amount of white at the bottom of the spear. A dull green hue and wrinkles in the stems are an indication of old age. Also look for asparagus that stands up straight--the stalks should not be limp. The asparagus tips should be tightly closed and compact--similar to an artist's paint brush--and not starting to spread out or sprout. Look for purple highlights, and make sure the tips are not soft and mushy. When shopping for asparagus, oftentimes you will find it standing in a shallow bin filled with a small amount of water (if the market maintains the display) or lined with a damp pad, which keeps the base of the stem from getting dry. If the asparagus is not standing in water, check to see if the ends of the stems are dried out and flaky. If so, try to find a bunch that has retained some moisture in its base. Fresh white asparagus should have the same qualities as green asparagus, obviously minus the green color. Asparagus comes in four sizes: small, standard, large and jumbo. There is a misconception that thinner asparagus is more flavorful and tender than the fatter stalks; however, as long as they are cooked properly, all sizes should be pleasant to the palate. It is best to choose stalks of uniform thickness for more control in the cooking process--thin stems will cook faster than thick stems. 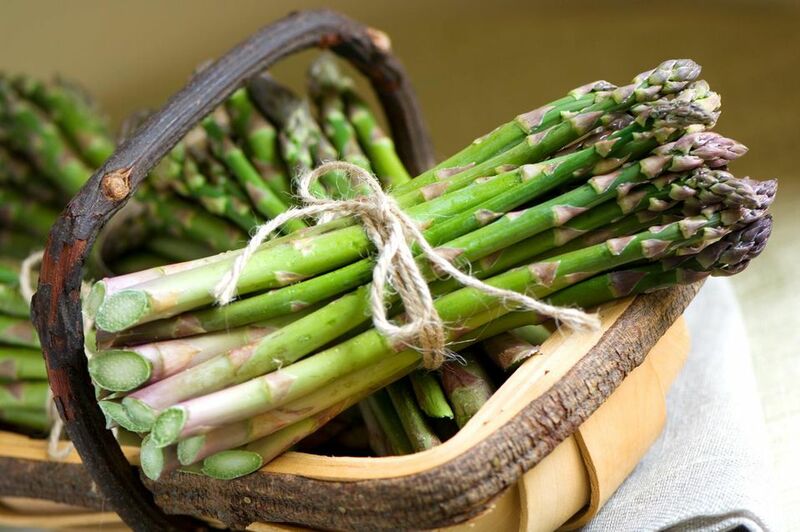 It is important that the bottoms of the stems stay moist during storage, but also crucial that the remaining parts of the asparagus do not get wet. Do not wash asparagus before storing and never soak it. Before placing in the refrigerator, trim a half-inch from the ends of the asparagus and stand them upright in a jar or glass with about an inch of cold water in the bottom. Cover with a plastic bag and store in the refrigerator for three to four days. To prolong the freshness (although there will be some flavor loss), wrap the fresh-cut ends with a wet paper towel, place in a loose-fitting plastic bag, and store in the vegetable drawer of the refrigerator. Depending on the thickness of the stems you may want to peel them. You can steam, grill, roast and stir fry to use as a side dish or add to a recipe.